LOL....Rabbit, the boat had a 90 HP Johnson, so maybe it should have been pulling the bike! And AZgl, I did all right, got the wing, lost the boat....which would YOU rather have? lol My ex and I are very friendly, helping each other make new starts, her with a new business I bought her, and I'm renovating the apartment completely upstairs for her. She's helping me still when needed in my photography studio. You really came out of your divorce smelling like a rose, I came out of mine with a severe case of road rash - she cleaned my clock. Back to better things like camping, don't overload your trunk luggage rack or might suffer cracks in the top of the lid like I did. Weird , i cant get a long with my wife for 5 minutes and were still married . You two seem to get along great and got a divorce . Now which of us is the dummy . Dont forget your fishing pole . I use a ten by ten dome tent, a cot and a square bag. I also carry 2 of each undershorts, tee shirts, over shirt and long pants. I carry 4 pair socks, 1 rain suit, jacket, vest, head cover, hat. For hygiene I keep a large zip lock bag with smaller bags inside containing a wash cloth, towel, liquid soap, deodorant, hair brush/comb, razor, dental cleaning product. 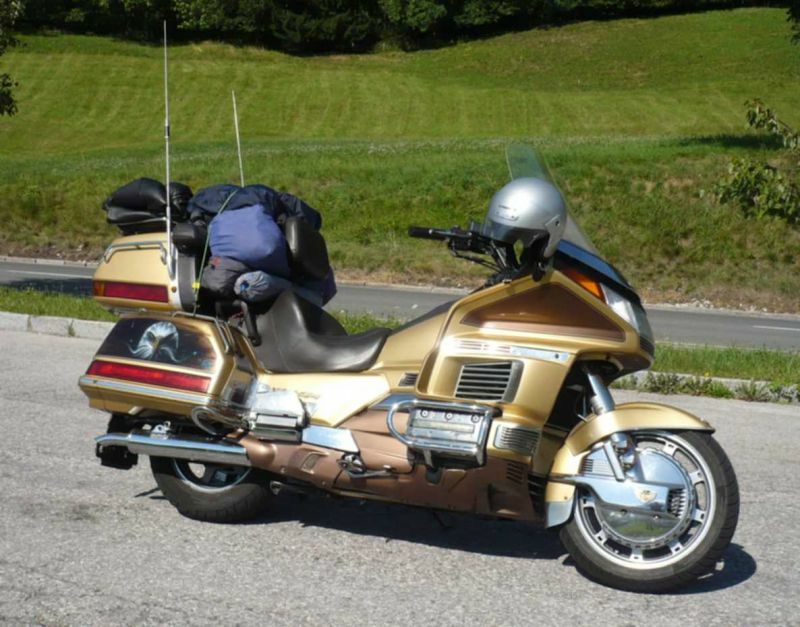 I can get all but tent and cot in the bags and trunk on an 81 GL 1100. I prefer a cot since it gets me off ground and has a smaller footprint for storage. Pile everything you need on the floor in your living room - then cut the pile in half and you'll still have more then you need. I'm down to a pair of nickers an a case of beer. A man should never have more girlfriends then he can afford - I need a better paying job. 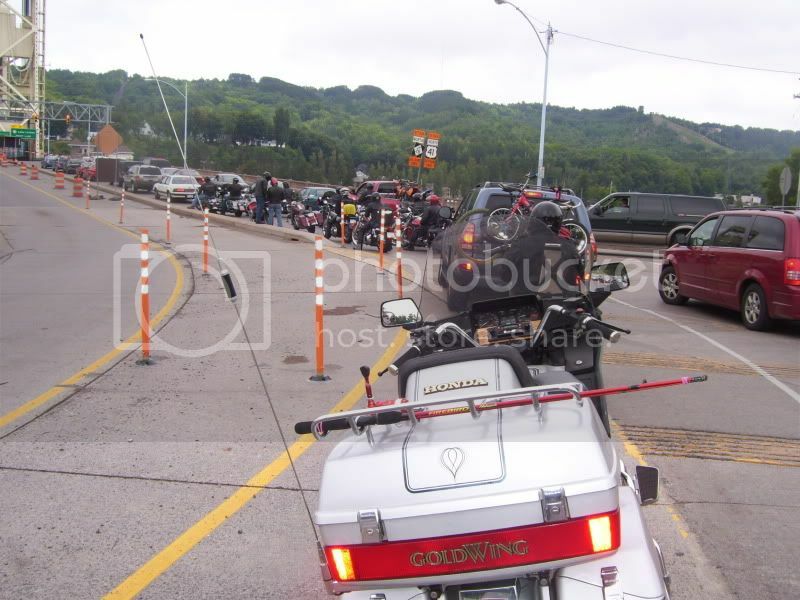 Many folks on the forum welcome other members to 'crash", at their place when your on the road. I've done this with the members of my Sabre=Magna group, and had them at my house, so it saves a lot of money, and made some friends too. 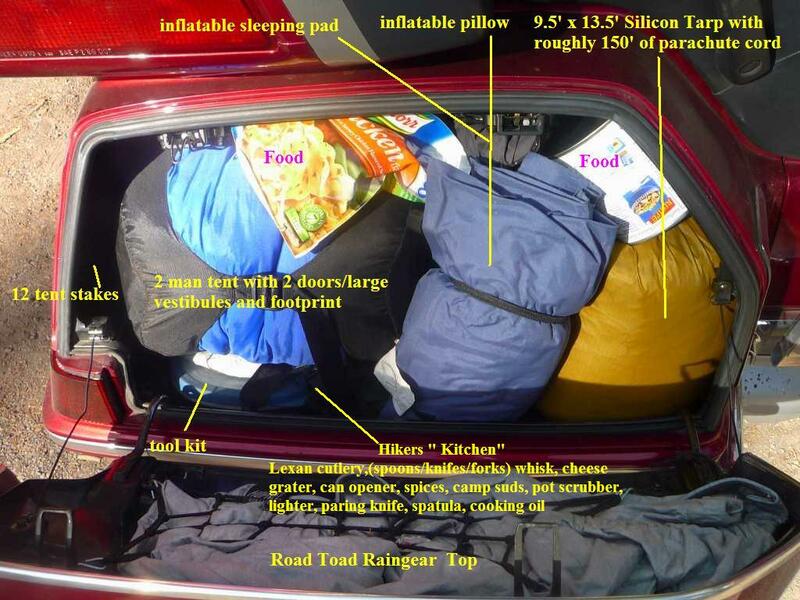 One option is to ship the camping gear to where your going and use inexpensive motels enroute. then the size of the equipment or it's weight becomes less important, When done ship it home. Solo on a Wing, it is not real hard to pack for camping but, 2up it's an issue, but it has been done. 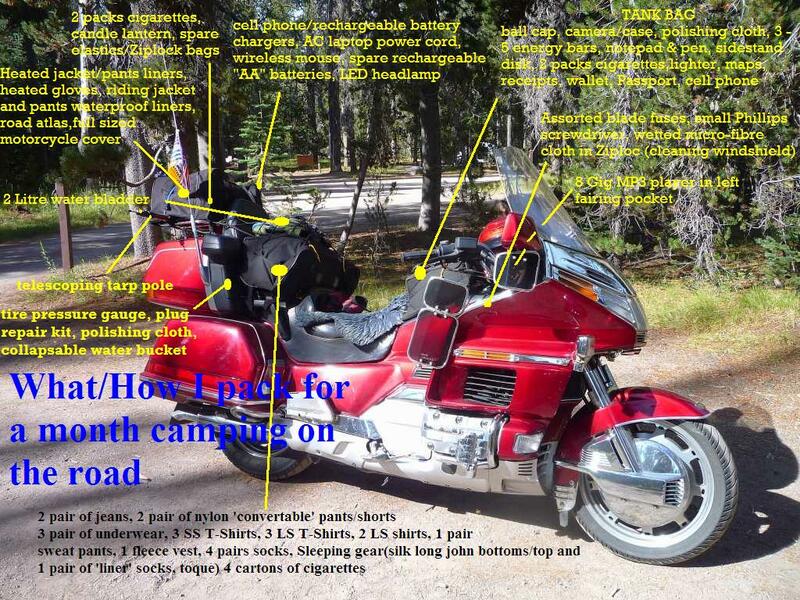 Tent, sleeping bag,pillow,leathers on the seat. Six days of clothes,includeing sox and underwear. Tools and few light but hard to get parts,tire repair kit and 12 v compressor.Spare qt oil.Frogg togs. 3/4 helmet,first aid kit,soft side cooler. A little heavy but the wing handles it well. Looking forward togetting into this....I expect to be riding 2up, so guess in order to keep that person happy, will have to see what their basic requests are....may need a basic trailer to help. I've probably forgotten a few things , but you get the jest of it. Thanks Dusty. 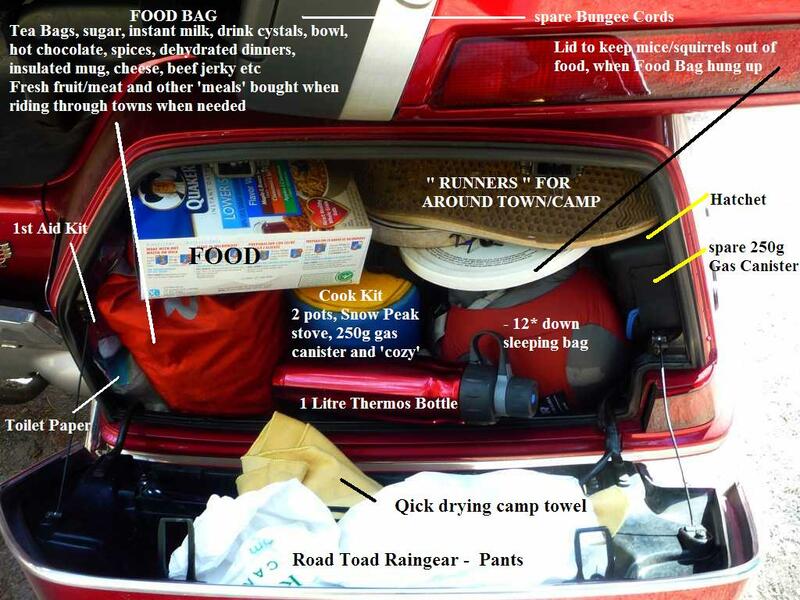 I'm gearing up for camping and the info you've given is excellent! Thanks again.